Absolutely. When I want to write, at home, I get up about 5, make coffee, slowly begin to be conscious. I’ll do a fair amount of other work, check email and Facebook and news sites, then I’ll bring my wife coffee and read the newspaper. It’s a long day’s reaching consciousness. By 8 I like to be at the computer and I like to write until about noon. Do you like to map out your books ahead of time, or just let it flow? I write my first draft on the computer. I used to write everything out by hand, but just don’t have the time, patience, or legible handwriting to make that possible anymore. I like to write quickly, so in ideal conditions I’ll have done a lot of research, made a lot of notes, before I sit down. But I don’t do an outline. By the time I could do an outline, I’ll already know what I need to say, so I’ll just sit and write. If I’m writing full-time I’ll get about 3,500 words per morning, four mornings a week. Wow, that is amazing. I’ve done over 50 of these interviews now, and the vast majority of writers aim for 1,000 words a day. 3,500 per morning is quite something. Well, I’m sure that their 1,000 is better than my 3,500, but this is just the way I do it. I always start by rapidly revising what I wrote the day before. So it’s very quick writing, and it takes a lot of revision, but this is the way I write chapters of my books. What is a distinctive habit or affectation of yours? With relation to writing, I have a couple. One comes to me from Mr. Hyde, my wonderful English teacher at Andover. He started each term with a trick, for example saying, “Gentlemen, this term you will learn to write without the passive voice. Please use the passive voice. As soon you do, I will stop reading your paper and give you an F, so you will be saving me time!” His point was not that we should never use the passive voice, but never to do so without thinking. This was a wonderful way of inculcating that principle. I still feel a pang of guilt when I use the passive voice. So I try for a very active style of identified subjects doing clear things to identified objects. One of my favorite teachers at Choate, Mr. Yankus, had a similar warning against using the verb “to be” in any essay. Maybe there’s something about boarding-school English teachers that they’ve all agreed on the same teaching tactics. Well. yes. 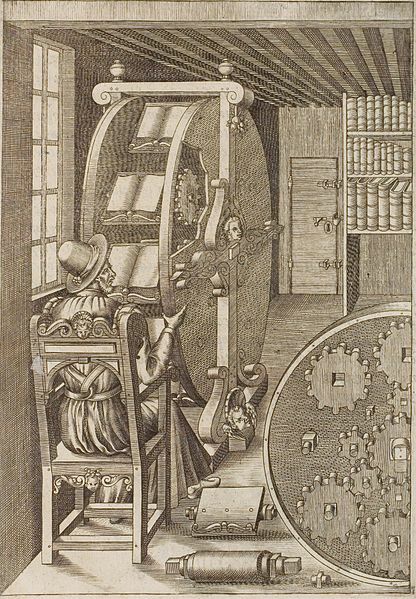 I’m looking at a full-sized replica of Agostino Ramelli’s bookwheel, on which I keep my dictionaries, and which fills about half of the small study in which I write. This was made for an exhibit at the New York Public Library in 1992. They had no room for it, so I managed to get it. I can spin my chair from my MacBook Air on which I write to the many dictionaries I depend on for reference. I’ve also got, you know, a crocodile hanging from the ceiling, a skull, a scale, an hourglass—my wife is working towards making my study into a little wunderkammer. There’s this wonderful verb in German that means “to hedgehog yourself in.” That’s kind of what I do to write. My main superstition is that when I’m writing a piece for a review, like The New York Review, I like to write the draft in one day. I don’t feel right if I can’t do that, writing it all in one sitting. 1. It's interesting that he doesn't get right at writing, as Francis Ford Coppola and others recommend, but looks at social media first. 2. I have the same superstition about writing reviews. 3. I have wanted a bookwheel like that for years. Years! It would go in my writing house. 4. 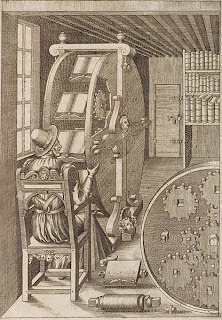 After seeing that Joyce Carol Oates video, I would love to see a similar piece on Professor Grafton, complete with bookwheel. 5. He sounds like a gracious man as well as a smart one. If this isn't writing inspiration, I don't know what is. The bookwheel is way, way, way cool, but 3500 words a day????? No outline?? I am chopped liver. When I write fiction, I can usually write 3500 words a day. However, I always set a low goal so I can make myself feel like a rock star when I go well beyond it. Also, writing fiction is so much more freeing than writing research. I get hung up on single sentences when I'm writing scholarly stuff. With fiction, it's a lot less constrained. As long as you make sense and follow the rules you set up for yourself, it's not difficult to write even 7000 words a day. There's just a huge difference between categories/kinds of writing. All work and no play makes Tony a dull boy. I am chopped liver right beside you, Dame Eleanor. I've been working diligently but my word count is about zero right now, except for prewriting. Fie, thanks for that perspective. As someone who's not a fiction writer, I've wondered if that would make a difference. Dr. Koshary, are you saying that in between writing sprints he bounces a ball off a wall and chases Shelley Duvall up the stairs? Whatever works, you know? Although I would probably let Duvall off the hook at this point. Seems unfair to make a 64-year-old sprint like that, even if Grafton is about the same age. Wow. If I could do 3500 words a day, I'd be a multi-book author by now. Sigh. These days I do the happy monkey dance if I get even 100 words down. My problem is that I first start revising what I've written the day before and this throws me off I think. I am now going to be obsessing over ways to incorporate a book wheel into future life somehow. I have to admit that I try and do what he does with articles or chapters, and do them in as close to one draft as possible. On the other hand, I start with an outline. Obviously it's almost never practical to blast out a piece of academic writing in one go like that, so when I pick up again the first thing I do is read through what I did already, tweaking slightly here and there, to try and get myself to the same point in the argument as I was at when I had to stop. This doesn't work as well as doing it in one flood, though it is sometimes good at picking up bits that don't actually make sense when viewed in the cold light of day. But sometimes that means that I've just lost the point where I saw it most clearly. Anyway, once a text exists, and has been footnoted so that I know which bits I made up and can remove or replace them, there comes lots of revision and trying to get other people to read it (the last being the hardest bit). But really, the only reason I can't give you 7000 words in a day on something where I've worked my views out as far as an outline is that I almost never have the six or eight hours together to sit at the machine and do it, I'm afraid. (I talk like this too, until I'm stopped.) The real work is going on at the outline stage, for me, and that involves a lot of talking to myself, stalking round rooms and getting distracted by any book I pick up.